Concordia’s Business Scholars program was created to attract and challenge high-achieving students who want to be part of a thriving Christian community. Concordia’s Haab School of Business Administration annually accepts applicants into the program based on their grade point average and college entrance exam scores. To be eligible to apply, students must earn a minimum GPA of 3.5 and a minimum ACT score of 25. On Monday, March 5, the Haab School of Business honored its latest Business Scholars during Daily Chapel. 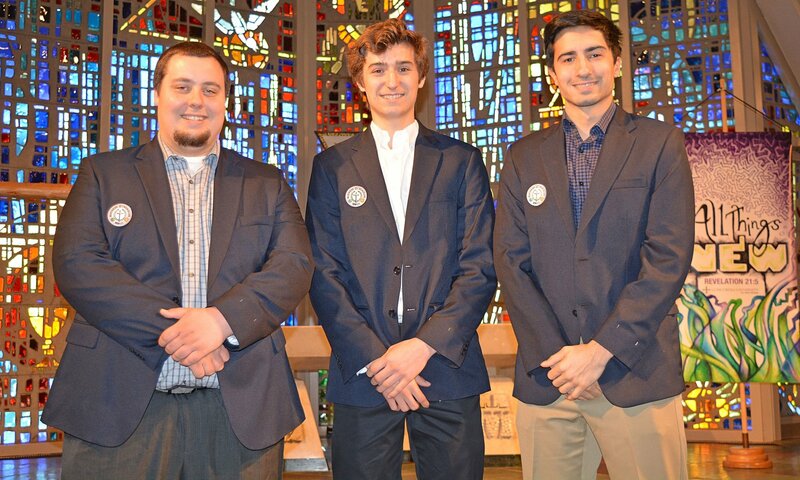 The students in the program received an official scholar jacket and recited the Business Scholars Association oath reflecting their strong commitment to Christian accountability and responsibility in their business and life pursuits. Haab School of Business Scholars stand with Kaye Haab. Pictured left to right: Matthew Korte (’19), Derek McComas (’21), and Jonathan Detwiler (’19). 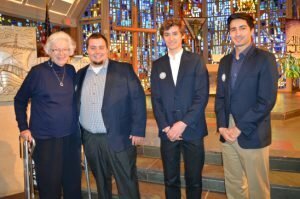 The honorees included Jonathan Detwiler, Matthew Korte, and Derek McComas. Detwiler and Korte are scheduled to graduate in May 2019 with their undergraduate and MBA degrees, while McComas, a freshman, is just starting the program. Detwiler says he plans to attend law school or pursue a doctoral program after graduation. Korte says he hopes to work in sponsorship services for a professional sports team. This summer, as part of the program, Korte will take on an extensive internship with the semi-pro soccer team AFC Ann Arbor, and will work in sponsorship and sales with the club. While the rewards of the program are sweet (Business Scholars could graduate with both their bachelor’s degree and their MBA by the age of 21) the path to get there is quite rigorous. These elite student scholars are required to maintain a 3.5 GPA and complete internships related to both their undergraduate and graduate degrees. This is only possible by maintaining a year-round course schedule of full academic loads averaging at least 18 credits. Click here for more information about the Business Scholar program at CUAA. —Lisa Liljegren contributed to this report.